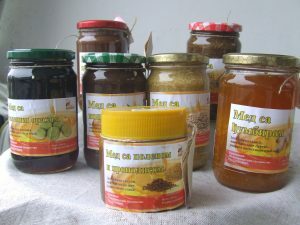 – Blends of honey and medicinal herbs (nettle, anise, ginger, sesame, green walnut, etc.) These products are completely natural blends of honey and plants. The composition of the preparations is adapted to a special purpose and it is used as prevention and aid in faster revitalisation of the organism in case of the below-listed health problems. The blends are not designed to be used as a substitute for medication, but as a supplement to healthy nutrition. The blend is rich in vitamins C and K, while a nettle leaf contains tannin, chlorophyll, formic acid, acetic acid, butyric acid, carotene, phytosterol and lecithin. It stimulates immunity and strengthens the organism, clears intestines, stomach and liver and improves blood circulation. It has a beneficial effect in treatment of anaemia, fever, urinary tract inflammation and it helps in rheumatic disorders. If consumed regularly, it removes anaemia within one month. 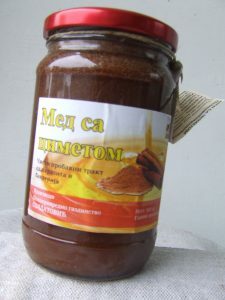 Use: The recommended dose is one or two teaspoons per day; honey should slowly melt in the mouth. A multivitamin preparation recommended for smokers, but also for children, because it is tasty and children love it. The essential oil of anise contains between 80 to 90% of anethol, a substance which alleviates breathing and stimulates extraction of mucus from lungs. For that reason, anise is very effective and pleasant medicament for cough, bronchitis and asthma. 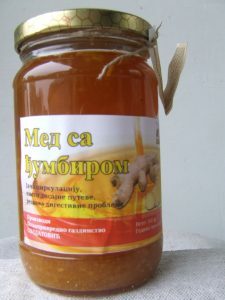 Use: The recommended dose is one or two teaspoons per day; honey should slowly melt in the mouth. A blend known as an excellent source of iron and calcium, providing a rich combination of potassium and magnesium salts. It is beneficial for those suffering from high blood pressure and cholesterol. It is excellent for treatment of the ‘married woman’ syndrome – fatigue, insomnia, lack of energy, etc. Use: The recommended dose is one teaspoon in the morning with a glass of cold water, or it can be used as spread. A blend which is considered a genuine ‘health bomb’, since it is a combination of honey and the plant known for its antiseptic and antibacterial properties. It alleviates hearth problems, urinary tract infections, bad digestion and cold, and it prevents and heals acne, pimples and spot baldness and clears digestive tract from parasites and bacteria. Use: A recommended dose is one or two teaspoons per day; honey should slowly melt in the mouth, or to be taken in a glass of water or tea. In addition, it can be applied on skin (for treatment of pimples and acne). A blend that can be used as an immunostimulant for boosting immunity, and it also has strong antibacterial and antiviral properties. 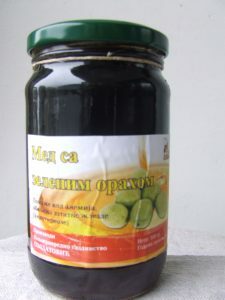 It is very effective against the cold and flu, improves the blood stream and clears respiratory tract, alleviates digestive problems and sickness (morning sickness, chemotherapy sickness, etc); it has a beneficial effect on digestion and appetite, alleviates chronic fatigue, migraine and tiredness after exercising; prevents blood clothing. Use: The recommended dose is one or two teaspoons per day. Green walnuts are a unique natural reservoir of vitamin C, but also of phenolic compounds. They are rich in minerals, such are iodine, potassium, magnesium, phosphorus, calcium, iron and zinc, sulphur, manganese and copper. Green walnuts mixed with honey produce positive effects in treatment of anaemia, help purification of liver, stomach and blood, and are also recommended for weak, ailing children and anaemic persons. The blend helps with underactive thyroid gland, throat and respiratory tract illnesses, bronchitis. It creates a physical, psychological and energy balance, increases hormone activity, helps regeneration of cells, neutralises the effect of toxins and boosts immunity. Use: A recommended dose is one or two teaspoons per day, best taken in the morning. Children may eat only honey, while adults can also eat walnuts. PROPOLIS. Propolis is the best researched bee product, known as medicament since the Antiquity. It is mentioned by Aristotle in his ‘History of Animals’, where he concluded that it can be used for treatment of skin injuries, wounds and infections. An increased use of propolis was recorded in the period of Boer Wars in South Africa, as a result of excellent results it produced in healing of wounds. Numerous studies have shown that it is effective against bacteria, fungal infections, viruses and inflammations and that it has anaesthetic, antioxidant and antitumor effect. Propolis is a natural antibiotic. It is used for treatment of the sore throat and digestive and respiratory organ diseases. It aids healing of wounds and burns. A special characteristic of propolis is that bacteria do not grow resistant to it and that it does not produce any side-effects, which is a well-known shortcoming of synthetic antibiotics. It effectively suppresses flu and herpes viruses and serves as a prevention against sore throat and paradentosis. It produces exceptional results in treatment of infections, burns, open injuries, as well as digestive tract ulcers. It removes swells in toothache. Its regular use boosts defensive capacity of immunity system. 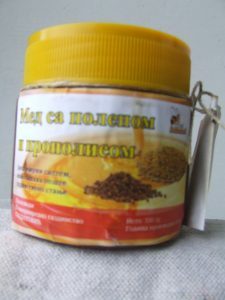 Prepared tinctures and propolis as a raw material are kept and stored in dark places, at the temperature that does not exceed the room temperature. 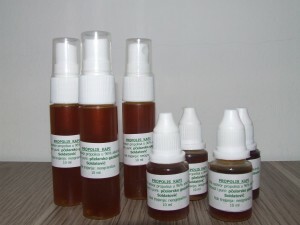 PROPOLIS DROPS are a natural bactericide, antiseptic and anaesthetic. Propolis drops with eucalyptus and mentha have a local, direct effect on mouth and throat infections, mouth ulcers, suppressing pain and inflammation processes. Indirectly, they produce a salutary and stimulating effect on the entire organism. Common doses are 20 drops three times a day, but, when required, they can be used more often, without the danger of overdoses. Drops should be poured into a teaspoon of honey, or consumed with a biscuit or similar, and then slowly melted in the mouth to produce a stronger effect on mucous membrane of the mouth and throat. Drops in the same amount can be consumed orally dissolved in little water, tea, lemonade, while keeping the solution longer in the throat. In case of occurrence of candida, the throat should be rinsed with the solution of 30 drops. Smaller superficial injuries can be successfully disinfected by propolis drops. 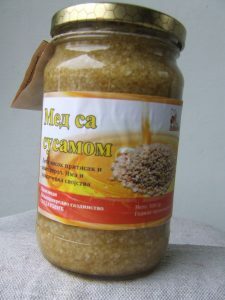 The preparation is absolutely natural, harmless and without any contraindication, ideal in the combat against cold and flu. A regular use is recommended for everyone, especially for persons with sensitive throat, elderly persons and smokers, particularly in cold periods, when the activity of bacteria and viruses is more intense, while the organism is more susceptible to their impact. PROPOLIS SPRAY is a natural, enhanced bee product in form of pure liquid propolis extract in ethanol solution. It is used 3-5 times per day, or more often. The advantage of the preparation is its practical quality, simplicity of use and powerful effect. A one-use dose involves pressing the spray disperser pump 1-2 times, while pronouncing the letter A to achieve the best effect. If necessary, due to occurrence of throat pain, aphthae, candidiasis, etc. the preparation can be used more frequently. Propolis is an antioxidant, biologically valuable bee product with a distinct antibacterial, antiviral and antiseptic effect. The preparation is completely natural and highly-effective, as a result of high concentration of propolis. It has an intense and local effect on mouth cavity and throat, with a short burning sensation and mildly unpleasant effect, but producing very effective results. It can be also applied locally for disinfection and prevention of infection of small superficial injuries. The product has no contraindications or adverse effects. Pollen is a unique gift of nature, optimally balanced, with a round proportion of valuable natural ingredients. Each particle contains all ingredients necessary for healthy life and normal development of organism: proteins, vitamins (A, C, D, E and a group of vitamins B), minerals (Ca, Cl, Na, Fe, Mg, Si), lipids, enzymes, essential oils and valuable antibiotic substances. It has a positive effect in treatment of anaemia and hypertension, calms down the overburden nervous system and alleviates the digestive tract problems. It produces excellent results in treatment of prostate. Its regular use improves the general condition of organism, alleviates the effects of stress and provides strength necessary for daily exertions. 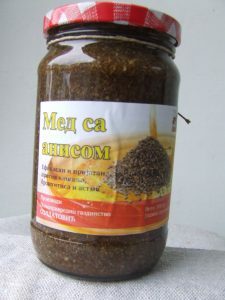 This exceptional blend is known as an elixir of longevity, and it is used as an immune stimulant for boosting immunity, increase of work capacity, normalisation of stomach function and it is recommended after operations and for patients undergone X-rays or treated by antibiotics and cytostatics. It used for improvement of general health condition. Pollen has an antibiotic and anti-inflammatory effect, provides protection of organism against various infections and improves blood cell count. The effects of pollen consumption can be felt from three days in some illnesses (acne, gastric ulcer, loss of appetite) to three years (allergies, radiation sickness). Bee pollen is best taken in the morning, fifteen minutes before breakfast. A teaspoon of blend can be diluted in warm or cold milk, tea, soured milk (best in the evening) and left for minimum eight hours. The excess amount of preparation should be kept in the fridge. The largest granules will gather on the surface and they can be used by diluting a teaspoon of the surface layer in water and drinking it after several hours.